Heavy Metal Classic Slot Review - Casino Answers! Heavy Metal is a 3-reel, 4-line classic slot machine developed by Slotland Entertainment, featuring a wild symbol, a hold feature, a free spins feature and a progressive jackpot. 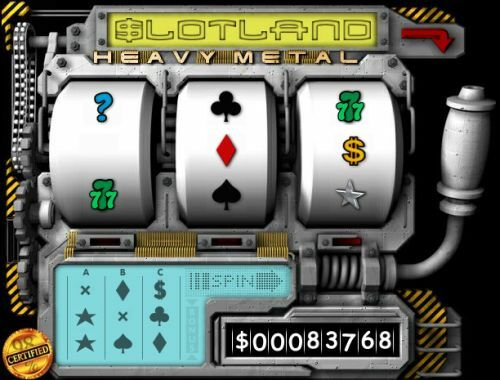 You can play the Heavy Metal classic slot machine at Slotland Casino. Bets on the Heavy Metal slot machine are $0.50, $1 and $2 per line. You can play the single center payline (Line 1) on the Heavy Metal classic slot or you can also play the three “historical” paylines – Lines A, B and C as well. You can bet different amounts on each payline. Total bets on the Heavy Metal online slot range from $0.50 per spin up to the maximum total bet of $8 per spin. Heavy Metal has a decent betting range that should suit most online slots players. To play the Heavy Metal fruit machine, select your bets and pull the lever at the right to spin the reels. The Heavy Metal progressive jackpot slot is linked to Slotland Casino’s progressive jackpot, which at press time was at $83,768 and increasing at a rapid rate. To win this progressive jackpot, you must land 3 Triple Seven symbols on a payline that you are betting $2 on. You can win this progressive jackpot on Line 1, A, B or C. If your bet is less than $2 on that payline, you will win the 640 coin top fixed payout. Play for the Slotland Casino Progressive Jackpot on the Heavy Metal classic slot at Slotland Casino! The wild symbol on the Heavy Metal casino game is the Question Mark symbol. 1 Question Mark symbol will act as a wild symbol and will substitute for other symbols on the Heavy Metal slot machine. However, if more than one “?” symbols appear, you will instead just double your bet. The Hold feature appears randomly during play on the Heavy Metal slot game. The hold feature allows you to hold 1, 2 or 3 of the reels on your next spin. This increases your chances of getting a win on the center payline. The display located below the reels will show your previously three spins. Line A will be comprised of the first reel of those three spins, Line B will be made up of the symbols that fell on the second reel, etc. 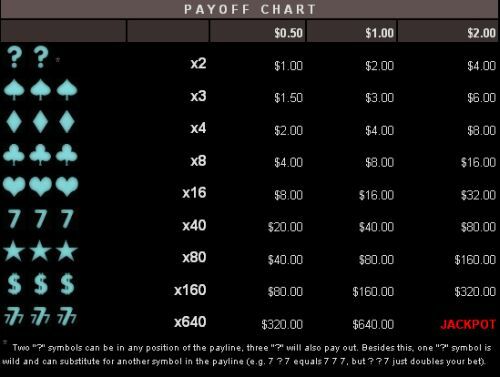 If you place bets on these paylines, if a winning combination appears vertically on one of these paylines, you will be paid out the same as you would for a win on the center payline on the reels. This feature adds much more strategy to the slot game. Underneath the slot game, you will see three Diamonds. Every time you land 3 Diamond symbols on the center payline, one of the three Diamonds at the bottom will be highlighted. Once all 3 Diamonds have been highlighted, you will win 3 free spins. The wild symbol cannot trigger the free spins feature. The Heavy Metal online slot has an interesting feature. It adds importance to every spin you make, even losing spins. They can be valuable as far as three spins later. You can play the Heavy Metal classic slot when you sign up and make a deposit at Slotland Casino. Do I need to download any software to play the Heavy Metal slot game? No, no casino software is required (or available) to play the Heavy Metal online slot. The Heavy Metal slot machine is exclusively played online. If I’m from the USA, where can I play the Heavy Metal classic slot for real money? American players can play Heavy Metal Slots for real money at Slotland Casino.